The holidays are a time for family, fun, and food. But with the incoming party invitations, family visits, marathon meals, and drink-fueled events, it can put stress on your body and wallet. During the holidays, time seems to go a lot quicker, with less opportunity to take care of yourself. Running between work events, family gatherings, and personal plans can lead you to lose track not only of your time but your sanity and health, too. From indulging in those “limited-time only” holiday drinks to eating out, your health may not be a primary focus this season, and neither is your wallet. There are many ways you can help yourself stay healthy, physically, mentally, and financially through the holidays. And for when you’re not feeling your best, there are ways to save on those doctor visits. Know your limits ahead of time and set yourself up to succeed. Notebook planners are a great way to stay organized, but there are a variety of online and app-based organizers to help you keep track of your time, health and budget. It’s easy to go overboard with money during the holidays. It feels awesome to find the perfect gifts for friends and family, but not as awesome when those gifts leave you with nothing left in the bank. Set a budget for how much money you want to spend and stick to it. Personal financial management app Mint can help you track where you spend your money and even offer suggestions where to cut back. While you’re spending, why not put some away too? Acorns is an app that automatically invests your spare change. After linking the app to your bank account, it will round up your purchases to the nearest dollar and invest the difference in a robot advised portfolio. It’s easy to say goodbye to fitness and health goals until after the holidays (and say hello to cookies), but maintaining a healthy lifestyle during the holidays is key to keeping you feel balanced. If you need help holding yourself accountable, using apps like calorie counting and fitness tracking app MyFitnessPal will help you stay in line with real-time updates. You can set the app to remind you to log in and track your calories or even remind you to take that extra run you said you would. The RunKeeper app also allows you to track running, walking, and hiking. 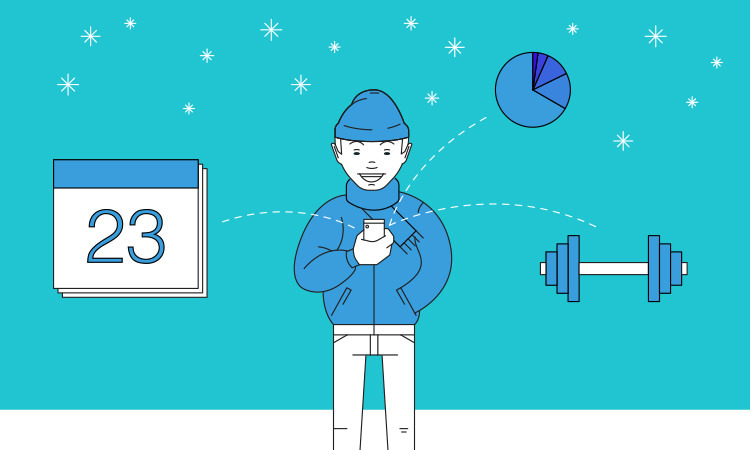 You can set goals, track progress, and even share workouts with friends. RunKeeper will even remind you of your pace and timing and sync with your Spotify to give you your favorite music as you exercise. So the next time you’re invited to a last minute happy hour, a quick glance at your calendar, budget, and calorie tracker will help you make an informed decision without feeling guilty about it later. Stress can creep up when you least expect it. It can stem from a variety of factors, but one way to help ease your mind is to take a moment for yourself. Allow yourself some “me-time” when you can go outside for a walk, dive into your favorite reading material, or listen to a few of your favorite songs. With phone calls from far away relatives and texts about holiday drink plans, it’s easy to spend hours on your phone. Take a break from social media and be present with family and friends to be “in the moment.” Try turning off notifications so you’re not reminded every time someone posts a photo on Instagram and forced to check your phone. Set time limits for yourself when using your phone. The app Moment can track how much time you spend on your phone. You can set daily time limits, and the app will notify you when you go over those limits. According to Mayo Clinic, giving yourself a moment to mentally relax provides a critical moment for your brain to catch up. No matter how crazy things can get during the holidays, don’t forget to reward yourself with these quiet moments. Holiday events tend to disrupt our routines. Dinner get-togethers, recurring holiday happy hours, office parties, and ugly sweater parties are constantly interfering with our good intentions to eat healthily and workout. Work your holiday events around your existing routine. When your body and mind aren’t used to a change in routine, the buildup of stress can lead to anxiety disorders. That’s why it’s important to honor your routine whenever possible. Learn to say “no.” It’s easy to get caught up in invitations and feel the pressure of attending every event and occasion. You don’t have to make yourself crazy going to party after party, especially if you don’t want to go in the first place. Prioritize which events are most important to you and don’t feel bad about RSVPing “no” to the others. It may feel uncomfortable at first, but your body and your mind will thank you later. Tuck in early with a tea and a good book instead of going to your cousin’s friend’s office party. If you feel your anxiety getting bad or spinning out of your control, consider visiting a mental health specialist during this time of year. If mental health is not affordable with your current coverage, SingleCare offers its members access to reduced-price, mental health visits across a wide range of specialties, including psychology, psychiatry, and counseling via Amwell video doctor visits. Family hugs, company handshakes, crowded flights, and tightly-packed shopping malls expose you to more germs than usual. Be mindful of others if you begin to feel sick. Wash your hands, keep tissues handy, and visit your doctor if it worsens. If you don’t have insurance coverage, having to spend money on a doctor’s visit is the last thing you’ll want to do with the holidays already putting a strain on your wallet. You’re heading to Grandma’s house across the country and feeling great. You step off the plane, and suddenly you have a cold? You’re not imagining things! According to a study in the Journal of Environmental Health Research, colds may be more than 100 times more likely to be transmitted on a plane than on the ground. Protect yourself against those pesky plane germs with these easy tips. Hydrate! Dehydration combined with the low cabin humidity can cause headaches, fatigue, sore throats, and lessen your immune system. Drink water throughout the flight and try to avoid the temptation of caffeine. Sanitize! Pack a travel-friendly hand sanitizer to use before and after any in-flight meals. It’s always best to wash hands before eating, but if you don’t want to wake up your seatmate (again), have your sanitizer on hand for a quick refresh. Stretch! When the captain gives you the all-clear sign, get up and take few laps up and down the cabin. Do a quick stretch to get your blood pumping and your body moving. Simple ankle raises and neck rolls in your seat can help prevent you from feeling aches and cramps when you deplane. If you’re starting to feel that a sore throat or a headache is coming on, don’t panic! Keep germs at bay by keeping your home in tip-top shape. Try these tricks to keep your surfaces clean and ready for the next party guests. Disinfect commonly used items like cell phones, tv remotes, and computer keyboards that can be a breeding ground for germs. Make sure you are using “disinfecting” cleaning products like easy to use cleaning wipes so you aren’t just pushing around germs. Teach children good habits early! Have tissues all around the house for easy use and remind them to cough into elbows and cover their mouths. Reinforce handwashing with soap before after meals to make sure they have healthy habits all year long. SingleCare’s commitment to providing its members with the best possible care means that members benefit from rates discounted up to 50%. Patients can schedule their appointments as needed and only pay for the services received. Joining SingleCare will give you access to a large network of top doctors and specialists in your area — without the hassle of limited coverage or a monthly hit to your wallet. NOTE: SingleCare is not affiliated with the apps mentioned in this article, and the above is not intended to act as an endorsement. Please do your diligence before using products and services not associated with SingleCare.